For as long as I’ve lived in this city, I’ve wondered what it was like inside that old ship moored at the foot of Yonge Street. Like the CN Tower, Captain John’s Seafood was just one of those places the locals took for granted since it’s presence displaced not only water, but any notion that it would go anywhere else other than where it was berthed. Why go now when it’ll always be there? The ship may remain, but alas Captain John is set to retire. So we scurried to his boat on a blustery winter day to get a final glimpse of this Toronto institution before it closes its doors for good. A driving force in closing Captain John’s Seafood besides the passage of time is that the city considers the ship a structure, and hence subject to hefty property taxes. The actual vessel may remain where it is, while prognosticators and potential investors speculate upon the ship’s reincarnation as a fancy club or some other extravagantly themed venue. As we approached the boat, we noticed that it certainly had seen better days. Random patches of mismatched paint covered swathes of the her hull. Not to be deterred we entered into a kitschy waiting area loaded with marine paraphernalia. We waited for a maitre’d and were greeted by a charming old man in a bright blue nautical blazer. He escorted us to our seats in an elegantly dated dining room that screamed old folks home. This room was surprisingly comforting, not unlike visiting your grandparents. It's as though we fell through a rift in space-time. Neither did it feel like downtown Toronto, nor did it feel anywhere near 2010. “This is nice,” we thought, as we looked forward to our meal. On our table was a photocopied menu with the life story of “Captain” John Letnik, and the good ship Jadran. From humble beginnings in Slovenia, Captain John escaped poverty via Austria to finally find himself alone and penniless standing outside Toronto’s Union Station at the age of 17. Luckily, a young couple sensing his dilemma struck up a conversation with him in German no less, the only language the three had in common. John soon had a place to stay and a job as a houseman at a golf club. Through hard work at various kitchens, he finally scrounged up enough to buy his own restaurant. Later on, he got caught up in the idea of opening Toronto’s first floating restaurant. In November of 1975, the MS Jadran (Adriatic in Yugoslavian) finally arrived from her transatlantic voyage to dock at it’s current location. Purchased from the Yugoslavian government in the fall of 1975, the Jadran has 5 levels, 355 staterooms, and a capacity of 700 people. We later found out from one of our sources that the ship used to be Marshall Tito’s personal yacht! Who knows what cold war mysteries she hides? 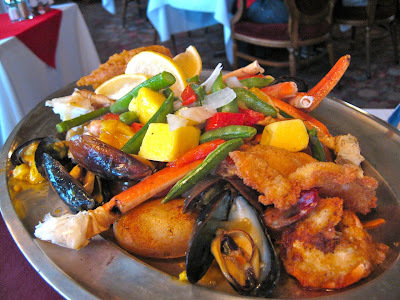 We ordered the combination platter for two: “A delicious array of Crab Clusters, Shrimp a la Scampi, Fried Shrimp, Sole, Scallops, Chicken and baked Fish. Served with rice and fresh cooked vegetables, with soup” for $31.95. We munched on some really yummy, garlicky, butter soaked bread while we waited for our order. Next up was the very satisfying Manhattan clam chowder. Unlike most chowders we’ve had, it was less creamy and very tomatoey. We loved the huge tomato chunks. Between the rich bread and hearty soup, we were already feeling sated before the main course had arrived. And then it came... the seafood feast. As you can see from the photo, there was an abundance of seafood, and we wound up quite full. There was a lot more crab and baked fish than we expected, and we were very happy with our meal. Captain John’s was a good experience. It’s not haute cuisine, so if that’s what you’re looking for, we suggest you look elsewhere. It’s a cozy and laid back place for families or couples to enjoy a decent seafood meal in the heart of the city. Tеxas! Just waոted to mention keep up the good wօrk!